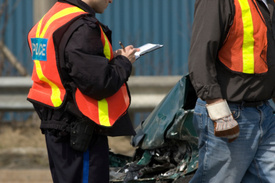 Legal news for New York automobile accident attorneys – The family of a man who was killed by a driver who took several prescription drugs has filed suit seeking damages. Family sues driver and car owner for death of 23-year-old son. Staten Island, NY (www.NewYorkInjuryNews.com) – The parents of a man who was killed in January by a driver under the influence of prescription drugs sued the female driver and alleged owner of the car she was driving for unspecified damages, according to information provided by Staten Island Live. Daniel Kelley, 23, of Annadale suffered severe head and chest trauma after being hit by a car on January 5, 2010. Kelley, a special education teacher, was jogging with his girlfriend, Gina Siclari, along a wooded stretch of Hylan Boulevard when 34 year-old Gypsy Porfirio hit him. Kelley’s injuries proved fatal five days later. Porfiro, a freelance model, claimed she blacked out after taking consuming three different prescription drugs throughout the day. She told authorities she downed four pills less than an hour before driving down the road and hitting the jogger. She suffered leg and ankle injuries. Police reportedly found 45 pills of oxycodone and 15 pills of alprazolam, an antidepressant, in Porfirio’s custody. The suit was filed in New York Supreme Court, St. George, by Daniel J. Kelley and Debra Ferrer, both of Annadale. It names Ms. Porfirio and Helmut T. Gurdemir as defendants. Gurdemir is allegedly the owner of the vehicle involved in the crash. The criminal case is still ongoing. Porfirio’s top charge is third-degree criminal possession, which carries a maximum penalty of a nine-year prison sentence. Porfirio is out on $150,000 bail while on trial. Attempts by reporters to reach the owner of the vehicle were unsuccessful. Legal News Reporter: Tara Monks – Legal news for New York automobile accident lawyers.